When we came across the fabulousness that is Culinary Kitchen, we just had to share with Oklahoma brides-to-be! Located in OKC, this kitchen speciality shop truly has it all. From the best kitchen accessories to one of a kind registry items to stylish home decor and gifts, Culinary Kitchen has a perfectly curated collection of the best and most unique items. If you’re a fan of color, you absolutely must check out all the fun items from the iconic Jonathan Adler. Looking for gourmet foodstuffs? Culinary Kitchen carries canned San Marzano tomatoes and French EVOO among other specialities. If you happen to go on a Saturday, chances are the expert staff is preparing something tasty in store for you to sample. Registering can be a daunting task, and their incredibly knowledgable staff is also available to assist with all things wedding registry. 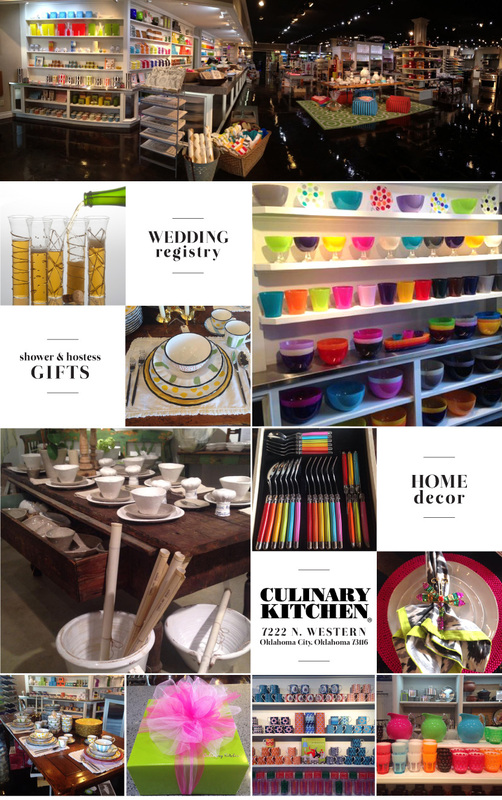 Whether you’re a culinary enthusiast, or simply love beautiful home goods, Culinary Kitchen is a must visit!